Bernard Hopkins vs. Chad Dawson: Who wins on October 15? "I give him all the respect in the world. I grew up watching him. "He's a great fighter. But I look forward to beating him on October 15." On October 15, WBC Light Heavyweight Champion Bernard Hopkins defends his light heavyweight crown against former champion Chad Dawson at the Staples Center in Los Angeles . The 46-year-old Hopkins (55-5, 32 KOs ) defies all logic and rational thinking. At an age when a rocking chair is in vogue, Hopkins chooses to beat-up people who are young enough to be his sons. “The Executioner” has morphed into “The Professor” applying amazing cerebral powers to go along with his still deadly physical tools. Chad Dawson (30-1, 17 KOs) looks to be the ultimate test for Hopkins . The bad mark on Dawson ’s record is a loss to Jean Pascal a fighter Hopkins handled officially once and unofficially twice. Dawson lacked focus and looked bored in the early rounds but began to catch fire as the fight moved into the later rounds. Unfortunately, a cut ended the bout just as Dawson was hurting Pascal. 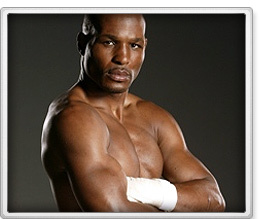 Hopkins twenty-three-year career has many highlights including a 12th-round TKO over unbeaten Felix Trinidad. He defeated William Joppy and knocked out Oscar De La Hoya. After finding the fountain of youth, Hopkins defeated Antonio Tarver, Winky Wright, Kelly Pavlik, Roy Jones and Jean Pascal. “Bad” Chad won the WBC light heavyweight championship when he handed Tomaz Adameck his first defeat. Dawson has beaten Glen Johnson and Antonio Tarver twice. His loss to Pascal was a major upset. Dawson is a boxer/puncher who likes to shoot his punches. His punching power is average at best. The X factor here could be Dawson ’s decision to part ways with Hall of Fame trainer Emanuel Stewart. The reasons given were geographical with Dawson wanting to train in the Pennsylvania 's Pocono Mountains, while Stewart’s prefers Detroit . Hopkins has a mountain of respect for Stewart. "He's a teacher," Hopkins said. "Not only do I have to beat Chad Dawson physically, I have to beat Emanuel Steward first. If you beat the teacher, you beat the student." Leaving Stewart could turn out to be a decision that Dawson regrets. However, the fighter begs to differ. He’s very comfortable with his old trainer John Scully. Both fighters have been talking knockout for weeks though neither has shown a propensity to deliver. Dawson last scored a stoppage in 2007 while Hopkins remembers his last. The oddsmakers have made Dawson a 2-1 favorite. His youth, size, and style all sound like advantages. He’s talking the talk but can he walk the walk? Hopkins talks it, walks it and bears it with pride. However, even the master is human. Dawson could be the second coming of Jermaine Taylor, who defeated Hopkins twice. So who wins on October 15? Dawson is no Jean Pascal. He possesses the kind of style that could give Hopkins fits. Using the Calzaghe fight as a template, Dawson will attempt to outwork Hopkins , keeping the champion busy with consistent punches. If he takes time off during a round, Hopkins will take advantage and steal it. Hopkins will eventually find his rhythm and begin to exploit some of Dawson ’s weaknesses. His experience will begin to show as he sets traps and score points. The fight will be close and could go either way. Nevertheless, based on recent history the edge has to go to Hopkins unless he suddenly does fight like a 46-year-old man.